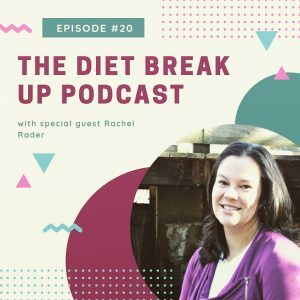 Listen to my interview on The Diet Breakup Podcast! One of my favorite things in the world is collaborating with talented people in the wellness field. I had a blast talking with Tiffany Deluisi on The Diet Breakup Podcast. We talked all about how diets don’t work, what we can do to shift our mindset, and how neither of us knows how to cook a pork chop. While you’re at it, go and rate the Diet Breakup Podcast on iTunes.